Katy Almstrom of Almstrom Financial Coaching: Harness the power of an effective budget to push you towards your financial goals. 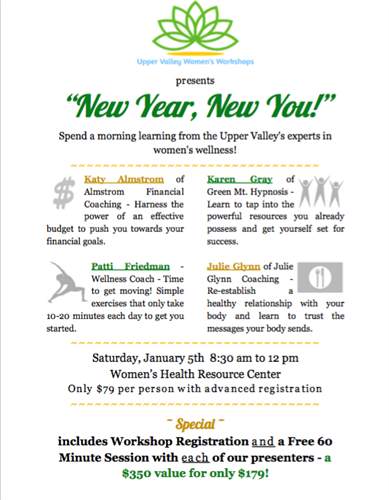 Karen Gray of Green Mountain Hypnosis: Learn to tap into the powerful resources you already possess and get yourself set for success. Patti Friedman, Health and Wellness Coach: Time to get moving! Simple exercises that only take 10-20 minutes each day to get you started. Julie Glynn of Julie Glynn Coaching: Re-establish a healthy relationship with your body and learn to trust the messages your body sends.